Around the world in a Piper Cub? 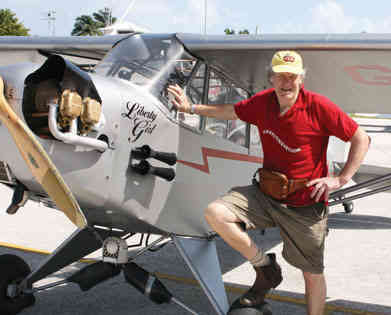 In the spring of 2001, Maurice Kirk threw a monkey wrench into a re-enactment of the great London-Sydney Air Race, in the form of himself and his L-4 Grasshopper, Liberty Girl. He was disqualified on the first day but stuck with the race (though generally far behind) for the next four weeks. I wrote about this wonderful story for Air&Space/Smithsonian magazine. Having successfuly reached Australia, he decided to bring the plane home by way of China, Russia, and the United States. In November 2004, Maurice made an incredible crossing from New Zealand to Australia, as the first leg of his around the world odessey. (Liberty Girl had gone to New Zealand to take part in an around-the-island race.) He spent the winter raising money, equipping himself, and getting permissions, and finally, on April 25, 2005, he set out again from Darwin. 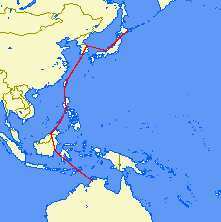 The map shows his route from Australia to the Japanese island of Hokkaido, where he arrived on October 7. After spending two weeks waiting for a weather window (a 30 mph tail wind was part of his plan) to make the perilous crossing to the westernmost of the Aleutian islands, Maurice realized that he wasn't going to do it. So he headed south, on his way back to Korea, where he would be allowed to crate the Cub and send it to Alaska by boat. (For some mad reason, the Japanese authorities wouldn't allow him to export the airplane. Evidently they felt that it had to leave the country the same way it came in, under its own power.) On October 22, he was flying to Hiroshima when he lost engine power over a mountain near the castle city of Kanazawa, on the main island of Honshu. The only open space was a playground filled with children, so he turned onto a roadway under construction, apparently taking out some utility wires and grazing two parked vehicles before coming to rest against a truck. After nearly two years in policy custody, Liberty Girl was released to her owner in August 2007. The plane was rebuilt in Maine, and in the spring of 2008 Maurice flew the refurbished beauty south, intending to make his way to the Falkland Islands off the coast of Argentina (and still claimed by that country). How he planned to reach Africa in anyone's guess, but we will never find out. Somewhere in the vicinity of the Turks and Caicos Islands, but 80 miles from the nearest shore, Liberty Girl's engine quit for the last time. 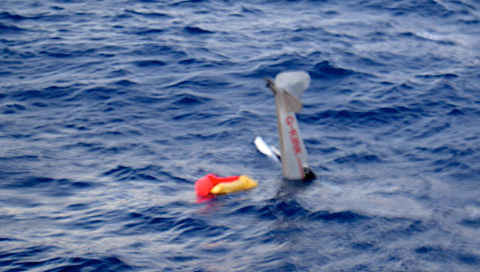 Maurice fired off a Mayday signal and ditched the little plane in the Caribbean. Maurice had filled the area behind the rear seat with styrofoam peanuts, which is why Liberty Girl floated so high, but in time she must have sunk, because a search plane turned up no sight of her. The photograph was taken by a crew member of the U.S. Coast Guard helicopter that snatched Maurice out of the drink. Maurice then acquired a Piper J-3 (somebody ought to stop him, while there are still a few Cubs left in the world!) and decided it would be a hoot to land the plane in Crawford, Texas, and knock on the president's door. Of course this involved busting the four-mile no-fly zone around the Bush ranch. You can guess how that worked out, right? Arrest--confiscation of his electronics (GPS, radio, camera)--ten days in a mental hospital--deportation--and revocation of his flying privileges by the British CAA. You can read about it on Maurice's blog. There's also a neat video of Maurice landing in a Texas field, in a 40-mph wind, and persuading a passerby to tie the Cub to a tree so Maurice can shut the engine down. And all this while, he's videoing the excitement! And would you believe Sydney to Boston? 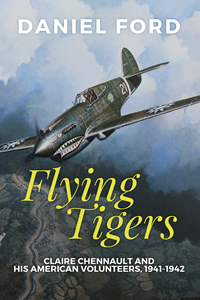 Earlier adventures of Kirk and "Liberty Girl"
Glen Edwards: The Diary of a Bomber Pilot - Fifty missions over North Africa--and a fiery death in the desert.